Also, make sure to check out the end of sale times for each game below the respective download link. At the time of writing (July 12th), some of these titles only have about several hours left in their "freebie" period, so it's advisable to download anything that you like fast. Without further ado, let's see what's on the list! If you're into adventure puzzle games like Monument Valley, Daregon is a game that you might wanna check out. In fact, the developers admit that the title draws inspiration from the popular indie title, as well as "The Witness" and "Zelda: Ocarina of Time". Guide the square through mazes, optical illusions, and remember that there's a walkthrough on YouTube if you get stuck on a tricky level. It's also worth noting that Daregon is getting a free expansion soon (according to the description), so the game has the potential to entertain over the long run. Infinity Dungeon Evolution is a good choice if you have some time to kill. The main characters stumble across a dungeon full of various treasures, and there's a bunch of dwarves that are ready to dig the riches up, save for the fact that the place if chock-full of all sorts of monsters. Your objective is simple - kill everything and get the booty. Buff Knight Advanced is a 2D Pixel RPG where you’re constantly on the move. There are two character classes - a knight who relies on melee attacks and a sorcerer who's ranged. Upgrade your weapon, armor, and character attributes, find multiple artifacts and slay the many monsters over the course of 12 stages of gameplay. Did you enjoy playing Flappy Bird? If the answer is yes, you will absolutely love PIXELMAN. Much like Flappy Bird, this title is a retro styled endless-flyer in which you chase a high-score, but it's certainly not rage-inducing. If features similar mechanics, but you aren't actually required to tap the screen repeatedly to get your character up and flying. 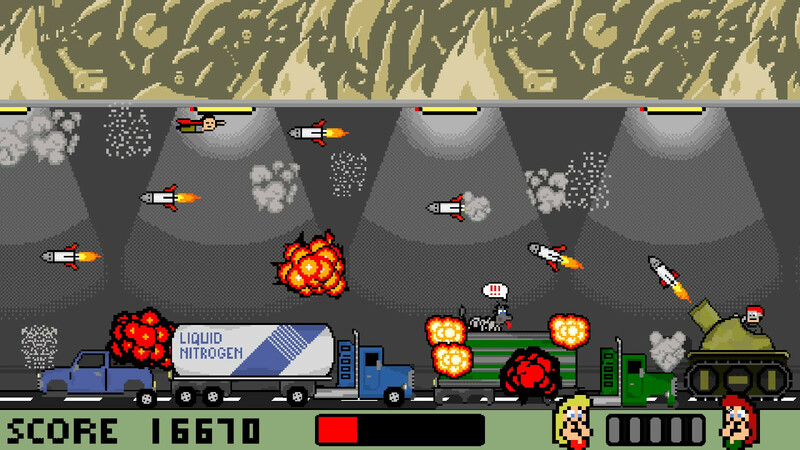 In PIXELMAN, your task is to save the many people, dogs, and cats taken hostage by the evil Baron Von Pixel, a bad dude who roams around in his World War I-era airplane, causing havoc in the city. Rescuing captives gives you the energy to fly around, and you can perform combos by freeing hostages without missing out on anyone. The Baron will try to interfere, using several vehicles with different abilities to try and stop you. This is one very polished title, and I'm baffled by the fact that it hasn't been downloaded that much.